Product prices and availability are accurate as of 2019-04-20 21:16:50 UTC and are subject to change. Any price and availability information displayed on http://www.amazon.com/ at the time of purchase will apply to the purchase of this product. With the help of our social media fans, we have created the SHANY Color Matters makeup cases. 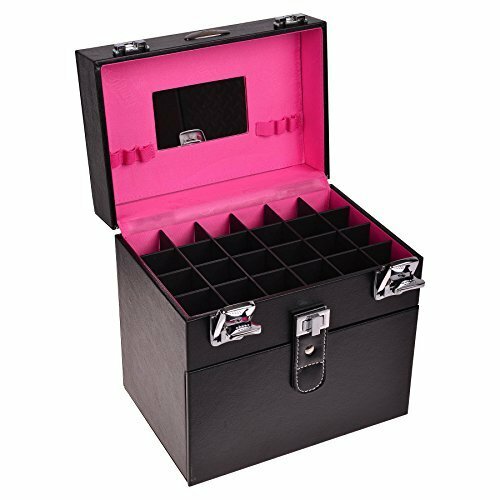 These cases can effectively store your nail polishes, nail tools, lipsticks, loose eye shadow, and many other individual makeup products. The first tier can is divided into 24 individual 1.5 in X 1.5 slots. The bottom compartment opens up and has an embedded pouch to help store makeup brushes, nail care items, and nail art products. It can also store other travel sized beauty tools. You won't have to limit the use of the products to only makeup and nail art. This case can also be adapted for jewelry and accessory storage. Each individual case has an exterior made of matte faux leather. Its smooth texture and vibrant colors match the unique and individualistic personalities of our #SHANYnation. The interior is lined with a water and stain resistant linen. If a spill does occur, simply dampen a cloth and wipe the spillage. Our cases are best known to last a long time while turning heads. They only difficult decision is which color to choose. SHANY is a member of PETA and all of our products are cruelty-free.